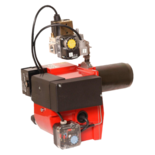 These burners are available for use on natural gas with a single stage on/off operation. They are available for both conventional and ducted air options and are typically suitable for domestic and commercial hot water boilers and air heaters. Sterling oil and gas burners are commonly used by many boiler manufacturers including Worcester Bosch, Trianco and Grant. All Sterling burners have been design in accordance with EN676 and EN267.